We all love those “special” characters (a.k.a. glyphs) that make our text look so great. But how do you access them in Silhouette Studio? I will tell you that the easiest way to access these characters is to upgrade the Basic Silhouette Studio to at least Designer Edition. 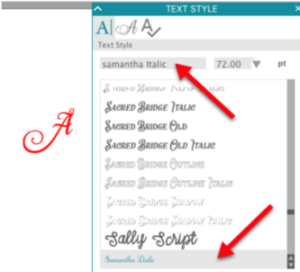 This will give you quick easy access to these characters in the Glyphs tab of the Text Style Box. Click on the Text tool and then click in the design space to open a text box. Click on the Text Style box on the right side of the screen. Click on the second tab, the Glyphs tab. Make sure that the font you want to use is selected. Scroll down in the Glyphs box and locate the letter you wish to use. Click on the letter and it will be inserted in your text box. You can continue in this way until you have all the special characters added. Start with a word already in the workspace. Highlight the letter you wish to change. Click on the Glyphs tab in the Text Style box. Make sure your font is selected in the font dropdown. Scroll down and locate the letter you wish to insert. Click on the letter to insert it in your word. If you have a Mac and the basic edition of Silhouette Studio, you can still access the glyphs and other special characters in a font. Open the application called Font Book on your Mac. Scroll down and locate the font you want to use. Click on the second icon at the top so that the individual letters are displayed in the preview window. Scroll down the right side of the Preview Window and locate the letter you want to use. Click on the letter to select it. Use CMD-C to copy the letter. Return to Silhouette Studio. Use CMD-P to paste the letter into the workspace. If you have not already selected the font, you will see a box instead of the letter. With the “letter” selected, click on the Text Style icon. 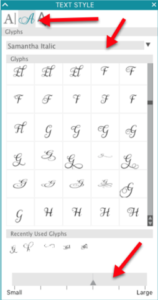 Select the font you want to use and the letter should change to l ook like the letter in Font book. 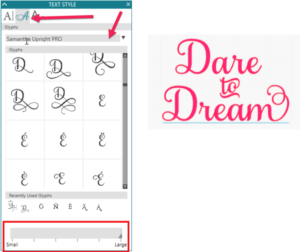 Continue locating the individual letters and using Copy/Paste to place all the letters in your Silhouette Studio workspace. Open the application called Character Map on your PC. Select the font you want to use from the dropdown list. 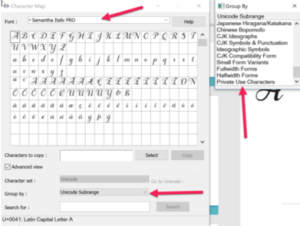 Select Unicode Subrange from the Group By dropdown. In the flyout window, scroll down and select Private Use Characters to see all the additional characters. Scroll down and locate the letter(s) you wish to use. Click on the letter and a box will display the letter. Click on Select and the letter is placed in the Characters to Copy box. When you have all the characters you want to use, click Copy. Paste the special characters into place. 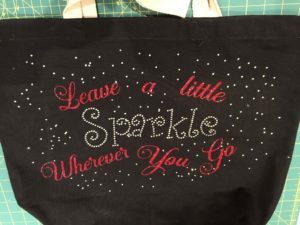 You can work with one letter at a time or several letters at once. 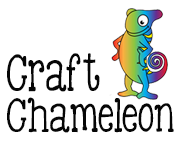 Ultra Character Map is a great program available for the Mac that has more features than Font Book. 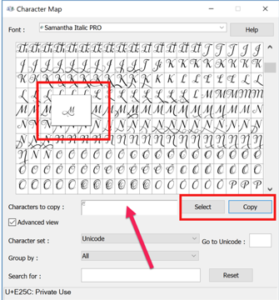 Nexus Font is a similar program available for the PC that will allow you to see your text in the font you select before you copy and paste. 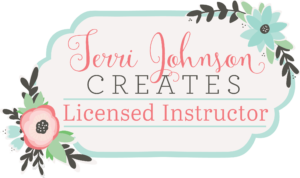 It also lets you copy and paste letters to use in your Silhouette software.